Whether you just want to make the occasional drink, or are starting down the road of building out a full home bar, there are a few items that you really just can’t live without. So, what are the bare essentials when it comes to bar tools? That’s it. Really. Armed with these few tools, you can put together nearly any cocktail. So, now to select your chosen implements. When making drinks, a good recipe will indicate how the ingredients are combined. For all those out there that need vigorous mixing to create a solution, to properly chill the drink, or emulsify something like egg whites, you’re going to need to shake your beverage. For that, you’ll obviously need a shaker. You have three basic options when it comes to shakers: the Cobbler, French, and Boston. The Cobbler shaker is often what you’ll find included in cocktail sets sold in stores, and can be found made from a variety of materials, often in different combinations. 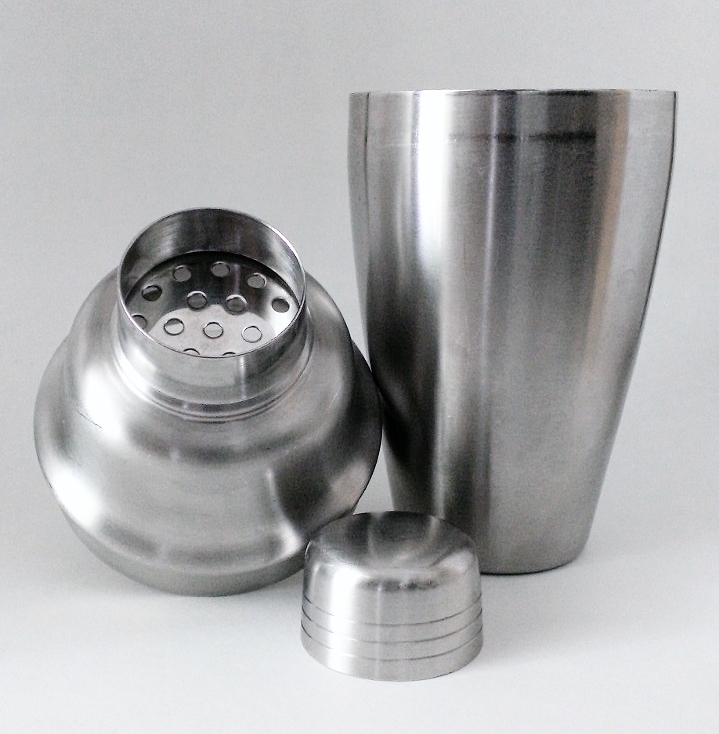 It consists of three pieces: the body of the shaker itself, a built in strainer that fits into the body, and a cap that closes off the strainer. The French shaker is a two piece affair, appearing very similar to a Cobbler style shaker. It consists of a bottom and cap, typically of metal, that fit snuggly together. The Boston shaker is hat you’ll see behind most bars nowadays. It consists of two parts; a metal bottom and a glass (or sometimes plastic) mixing glass that are fitted together. Now, I mentioned a potential fourth item, and if you go with a French of Boston shaker, this is where that comes in. While a Cobbler shaker has a strainer built in, you’ll need a strainer for the French and Boston shakers. You’re most likely to end up with a Hawthorne style strainer, as they are the most commonly found. 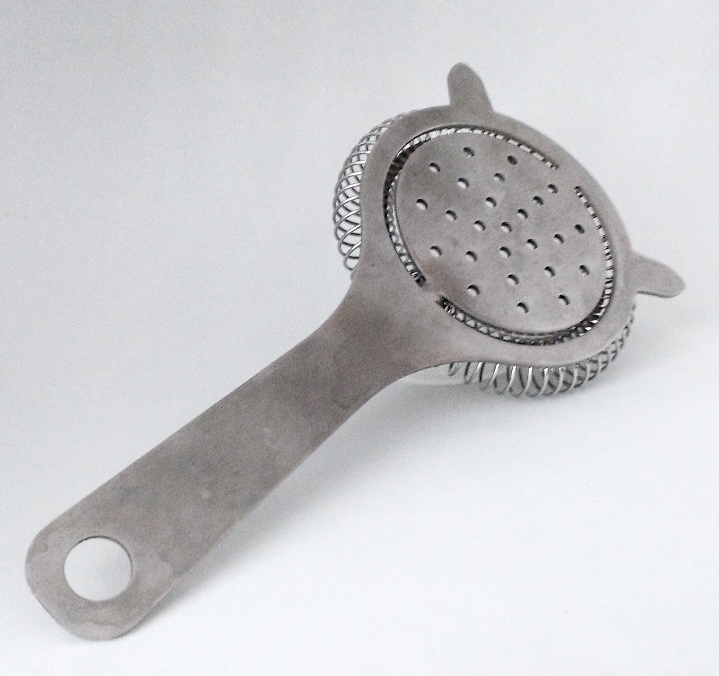 A Hawthorne strainer is a metal disk with a handle, and typically two prongs on the sides, perforated by holes or slots, and ringed by a spring that helps it fit into various sizes of shakers or mixing glasses. Not as commonly found are julep style strainers. Julep strainers are bowl shaped with a handle on one side, and perforated with holes. 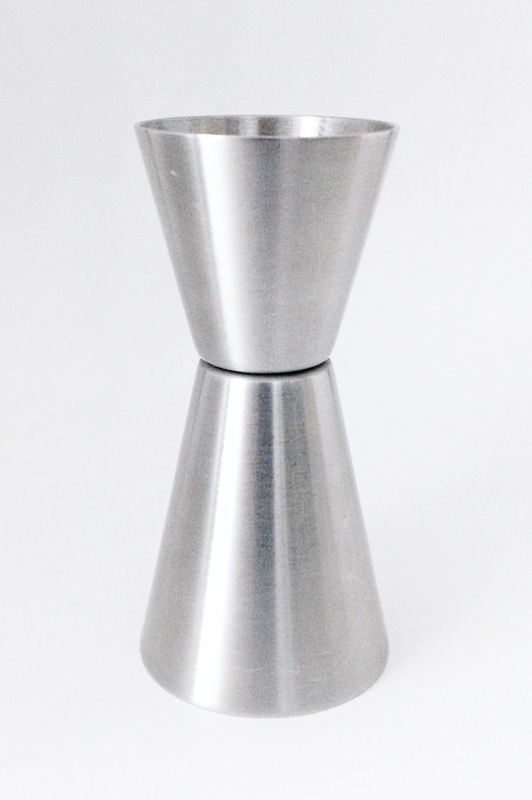 Julep strainers can be a little trickier to use at first, as getting a snug fit into your shaker may require angling the strainer so that it sits correctly, and fits without too much of a gap which would defeat the purpose of using a strainer. Okay, so now you have a vessel in which to mix your drink, but how to tell that you’re putting in the right amount of each ingredient? Yes, you could free pour, but getting the right proportions is just as important as using the right ingredients when crafting a cocktail, and free pours are not terribly accurate; even if using a spout, bartenders need to practice there pour counts to maintain a decent standard, and even then, free pouring will never be as accurate as measured pours. You can always make do with a simple shot glass. Chances are you may already have one lying around in a cabinet, and it does technically serve a dual function as glassware as well for those moments when you need to pound back a tequila slammer. My recommendation is to get yourself a jigger. The jigger is named for the unit of measurement it represents; that being 1.5 fluid ounces. At it’s most basic, a jigger is simply a more accurate shot glass. That said, there are many varieties of jiggers such as single or double cups versions, often with different sized measures, and with or without a handle. Here in the States, the most common jiggers you’ll find will be made of metal, and consist of two different sized wells; a 1.5 ounce and .75 ounce combination. One of the most important things when making high quality cocktails is using fresh ingredients. Toss out that bottle of sour mix, and instead pick up some fresh lemons and limes! Right, now you’ll need something to cut those delightful fruits with, and perhaps to shave off a piece of peel for a garnish. All you really need is a simple paring knife. It doesn’t have to be fancy or expensive, it just needs to be sharp enough to cleanly and safely cut through the ingredients you’ll be using, typically citrus. In a pinch, you can use it as a stirrer as well, though I’m sure rattling your knife around amongst ice cubes isn’t terribly good for the blade. I primarily use a cheap little plastic handled paring knife (that could use a good sharpening, now that I think of it), and it serves me well enough. So, there you have it. Sure, there are some recipes that necessitate having some other gear like blenders or muddlers, and some things can be made easier by employing more specialized tools. In the end though, no bar should be without these basic items and armed with these few core tools, you can tackle nearly any cocktail recipe out there.